The Atlanta Hawks travel to Madison Square Garden to play the New York Knicks on Thursday, October 29, 2015. The opening line for this game has Atlanta as 2 point favorites and the over/under has been set at 197.5. The Knicks are coming off an impressive 122-97 win against the Bucks while Atlanta is coming off a 106-94 loss to Detroit on Tuesday. Jeff Teague comes into this contest averaging 18 points per game so far this season for the Hawks after one game. He pulls down 2 rebounds per game and dishes out 4 assists per game as well. His field goal percentage is 44%. Paul Millsap averages 19 points per game this season. He also averages 3 assists per contest and 8 rebounds per game for Atlanta. His field goal percentage is 47% for the year. Carmelo Anthony averages 11 points per game this year for the Knicks. He grabs 6 rebounds per game and has 5 assists per contest on the year. His field goal percentage is 25%. Kristaps Porzingis averages 16 points per game this season. He also averages 5 rebounds per contest and 1 assist per game. His field goal percentage is 27%. Atlanta averages 94 points per contest this season which ranks them 25th in the NBA. Their average scoring margin is -12 and their shooting percentage is 45% as a team which has them ranked 13th. Behind the arc they shoot 30% which is good for 20th in the league. They average 44 rebounds per game and 22 assists per game which ranks them 29th and 13th in those offensive categories. In the turnover department they rank 13th with 15 per game. The Hawks allow 106 points per game to their opponents which ranks them 20th in the league. They also allow a 39% shooting percentage and a 41% average from behind the arc ranking them 6th and 23rd in those defensive categories. Opponents average 69 rebounds a game which ranks 30th and they give up 23 assists per contest which puts them in 20th place in the league. They force 15 turnovers per game which ranks them 16th in the league. New York averages 122 points per game this year which ranks them 1st in the league. Their average scoring margin is 25 and their shooting percentage is 45% as a team which has them sitting in the 12th spot in the league. Behind the arc they shoot 39% which is good for 8th in the NBA. They average 59 rebounds per game and 24 assists per contest which ranks them 9th and 7th respectively. In the turnover department the Knicks rank 4th with 11 per game. 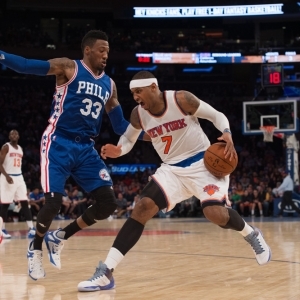 The Knicks allow 97 points per game to their opponents which ranks them 12th in the league. They also allow a 35% shooting percentage and a 50% average from behind the arc ranking them 2nd and 29th in those defensive statistics. Opponents average 57 rebounds a game which ranks 19th and they give up 17 assists per contest which puts them in 7th place in the league. The Knicks force 18 turnovers per game which ranks them 9th in the NBA.